Shamanism is a world-wide religious phenomenon, considered by many anthropologists to be the most ancient and fundamental form of spiritual practice in human life. Although shamanism is not present today in all societies, it can be found in societies at all levels of complexity, and in all parts of the world. There is a great diversity of forms and practices found in different shamanistic traditions, but there are several universal features that distinguish shamanism in general, and these can all be found in Korean shamanistic practice as well. The world is pervaded by spirits (normally unseen) who play an important role in the lives of individuals, families and entire communities. Certain individuals have a "calling" that allows them to communicate with the spirit world. The shaman can act as a mediator between the human world and the spirit world. These individuals (shamans) employ trance-inducing techniques to enter an altered state of consciousness (ecstasy, trance state, self-hypnosis) in order to interact with the spirit world. In the trance state the shaman acts as an intermediary between the spirits and a client. Shamanistic events are "critical rituals", in other words they occur "when needed" by a client or a community, rather than on a regular calendrical basis. Shamanistic rituals are performed primarily for "practical" purposes (healing, protection, solving problems, bringing good fortune, avoiding misfortune) rather than "worship". Although all shamans function as a channel between the spirit world and the human world, there are two main ways in which this can be done, and consequently anthropologists generally divide shamanism into two main categories, based on how the spirits are channeled: soul-flight shamanism, and possessive shamanism. In soul-flight shamanism, the shaman enters a trance state and then his soul journeys into the spirit world, where he encounters and interacts with various gods and spirit beings. This is all acted out very dramatically for the benefit of the shaman's client and audience. In the other type, the shaman puts herself into trance state and becomes a channel for different deities or the spirits of deceased individuals, who speak and act through the shaman. In both types the shaman puts on a "good show" for clients and audience. Soul-flight shamanism is found primarily in Siberia and the circumpolar region, while possessive shamanism is the type that is more widely found throughout the world. Kor﻿ean shamanism is of the possessive type. The traditional term for shamanism in Korea is Musok (무속, 巫俗) or Musok-Shinang (무속 신앙), although the term Mu﻿gyo (무교, 巫敎), which literally can mean "Shaman Religion", is becoming more popular recently. It might be best not to consider Korean shamanism as a "religion" in the normal sense. It is not so much a coherent system of beliefs as it is a set of practices, often combined with Buddhism with no apparent conflict or contradiction in the minds of its practitioners and participants. As a matter of fact, few people actually consider themselves to be "Shamanists", except perhaps for the shamans themselves. Most Koreans who follow or practice shamanism actually call themselves "Buddhists". Many aspects of Buddhist symbolism can be found in Korean shamanism, and aspects of shamanism have become incorporated into Korean Buddhism; neither one is completely exclusive of the other. In Korea the vast majority of shamans are women, although there are a few who are men. The most common term for a female shaman in Korea is Mudang (무당, 巫堂), but they themselves tend to prefer the term Manshin (만신, 萬神 - literally "Ten Thousand Spirits"). Male shamans in Korea are generally called Baksu Mudang, or simply Baksu (박수). The primary function of a mudang is the performance of an elaborate ritual called Gut (Kut 굿) in which the mudang will act as the mediator between the spirits and the people. This is sometimes called an "exorcism" ritual, but that is not an appropriate term, and the Gut cannot really be equated with the western Christian concept of exorcism. A Gut may aim to placate the spirits of the deceased, especially those that have died with unresolved personal problems, but it is NEVER about expelling evil spirits or demons in the Christian sense. A Gut may be a small affair with a single client or family, or it may be a lengthy performance for the entire community. It may take place in the privacy of someone's home, or at the mudang's own shrine or a shared spirit hall (Shindang, 신당 神堂) , or it may take place in a large public space (if it happens to be a community Gut), or somewhere in a natural setting, especially sacred spots by a mountain stream, a sacred tree, or a trickling spring. The objectives of a Gut can be various. They may aim to bring mental or physical healing to an individual client, to ensure the birth of a son, to reconcile the living with those who have departed, to placate the troubled and restless spirits of those who have died with unresolved problems, to bring blessings and good fortune to a family, a business or a community, to ensure a bountiful harvest for farming communities, or protection at sea for fishing boats. During the performance of the Gut the mudang will change into different colorful costumes associated with each of the particular deities and spirits who will speak through her. She will also act out the character of those spirits through dance and chanting, and the manipulation of typical shaman instruments such as swords, tridents, cymbals, jingle-bells, and cloth banners. 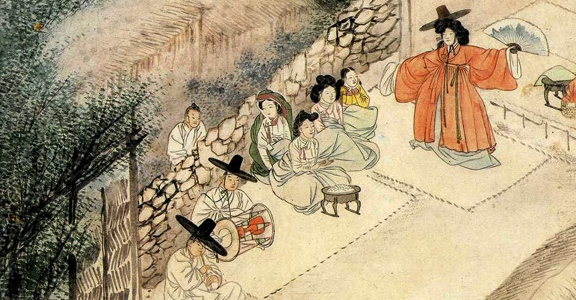 In the Ssikkim-gut (씻김굿) , performed to placate the souls of the recently deceased and to help usher them into the spirit world, however, the mudang and her attendants typically all wear white, and most of the banners and other items are predominantly white. Another common type of shamanist ceremony, the simplest do-it-yourself form that does not necessarily require the services of a mudang, is a blessing ceremony called Gosa (고사). This is often performed when someone buys a new car or new truck, for a new business undertaking or opening a new shop, or at the beginning of an important construction project. A Gosa will also usually be performed at the beginning of filming a new movie or TV series, with all the main actors and staff participating.